The TrikeBuggy Bullet is our next generation PPG Trike inspired from designs that are both visually appealing and highly functional. This design is for the paraglider version only and is FAA Part 103 legal as an Ultralight Vehicle or Aircraft. The TrikeBuggy Bullet version 3.2 is now ready! This is our latest design that features our new wider rear frame, which adapts to virtually every Paramotor available today! The new V3.2 lowers the Bullet Bars, giving the pilot better visibility and making it easier to get into the trike from above. PLUS - it features our new Stainless Steel SLIDER rear axle, making it even easier to transport the TrikeBuggy! 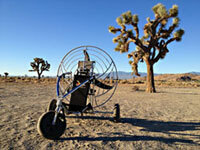 The TrikeBuggy Bullet "Stretch" Version 3.2 is now available for long legged pilots! This new addition to the TrikeBuggy Family includes the Extra-Long Front Downtube and Extra-Long Curved Tubes to add another 4" of length to the TrikeBuggy. The Bullet's frame is simple and solid. It is sleek and racy, giving the pilot a protective cage that will protect the pilot from contact with the ground in case of a rollover. The TrikeBuggy Bullet has one more distinguishing feature - it includes the Bullet A-Assists at no additional charge. These great accessories make the inflation of the wing a snap, with no input needed from the pilot! Simply hook up the A-Assists and watch your glider come up evenly every time (well almost!). The glider gets the best chance at a perfect inflation, since they always pull evenly on the A risers. The TrikeBuggy Bullet is available in the Deluxe version and the "Stretch" version for larger paramotors (Parajet, Fresh Breeze, etc.) and now the Mini-Bullet for light paramotors (Miniplane, PAP, etc. ).